This page is about Diamond TV Wonder 750PCIe WinXP-Vista7 Installation for Windows. Here you can find details on how to remove it from your PC. The Windows version was developed by Diamond Multimedia. Go over here for more information on Diamond Multimedia. Please open http://www.diamondmm.com/ if you want to read more on Diamond TV Wonder 750PCIe WinXP-Vista7 Installation on Diamond Multimedia's page. Usually the Diamond TV Wonder 750PCIe WinXP-Vista7 Installation program is installed in the C:\Program Files (x86)\Diamond TV Wonder 750PCIe WinXP-Vista7 Installation folder, depending on the user's option during setup. You can uninstall Diamond TV Wonder 750PCIe WinXP-Vista7 Installation by clicking on the Start menu of Windows and pasting the command line "C:\Program Files (x86)\Diamond TV Wonder 750PCIe WinXP-Vista7 Installation\unins000.exe". Keep in mind that you might get a notification for admin rights. The program's main executable file is titled setup.exe and occupies 24.00 KB (24576 bytes). The executable files below are part of Diamond TV Wonder 750PCIe WinXP-Vista7 Installation. They take an average of 16.97 MB (17799047 bytes) on disk. The current page applies to Diamond TV Wonder 750PCIe WinXP-Vista7 Installation version 7507 only. 1. If you don't have Advanced Uninstaller PRO on your system, add it. This is good because Advanced Uninstaller PRO is a very efficient uninstaller and all around utility to optimize your computer. 2. Run Advanced Uninstaller PRO. It's recommended to take your time to admire Advanced Uninstaller PRO's design and wealth of tools available. Advanced Uninstaller PRO is a very useful system utility. Safety rating (in the lower left corner). This tells you the opinion other people have about Diamond TV Wonder 750PCIe WinXP-Vista7 Installation, from "Highly recommended" to "Very dangerous". The uninstall string is: "C:\Program Files (x86)\Diamond TV Wonder 750PCIe WinXP-Vista7 Installation\unins000.exe"
7. Click the Uninstall button. A window asking you to confirm will come up. Confirm the removal by clicking Uninstall. 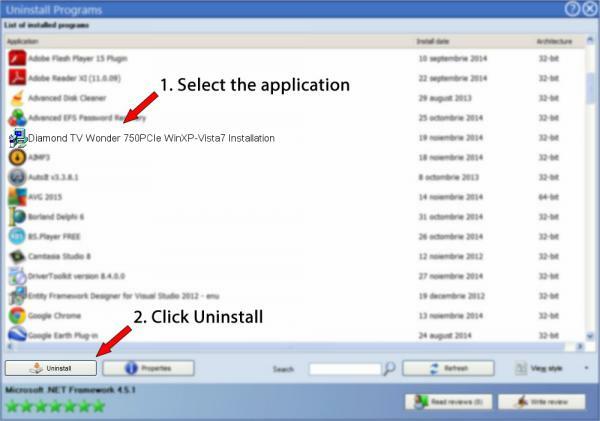 Advanced Uninstaller PRO will automatically remove Diamond TV Wonder 750PCIe WinXP-Vista7 Installation. 8. After removing Diamond TV Wonder 750PCIe WinXP-Vista7 Installation, Advanced Uninstaller PRO will offer to run an additional cleanup. Press Next to perform the cleanup. All the items that belong Diamond TV Wonder 750PCIe WinXP-Vista7 Installation that have been left behind will be found and you will be asked if you want to delete them. By removing Diamond TV Wonder 750PCIe WinXP-Vista7 Installation using Advanced Uninstaller PRO, you are assured that no Windows registry entries, files or folders are left behind on your PC. This page is not a piece of advice to remove Diamond TV Wonder 750PCIe WinXP-Vista7 Installation by Diamond Multimedia from your computer, we are not saying that Diamond TV Wonder 750PCIe WinXP-Vista7 Installation by Diamond Multimedia is not a good application for your computer. This page simply contains detailed info on how to remove Diamond TV Wonder 750PCIe WinXP-Vista7 Installation supposing you want to. Here you can find registry and disk entries that our application Advanced Uninstaller PRO stumbled upon and classified as "leftovers" on other users' PCs.